I just wanted to take a minute to say how impressed I am with Hoosier Boys Kennel and the quality of dogs they produce. I came on here to begin my search for a gun dog puppy when Ryan of Hoosier Boys contacted me about an upcoming litter he had planned. He invited me to come check out his kennel and dogs and I was very impressed with the cleanliness of the kennel and size of each dogs pen. I have seen some pretty miserable places and it was nice to see someone who really took care of the animals. Ryan was also very generous with his time in allowing my wife and I to come visit the new puppies only a day of so after they were born and then every other weekend (basically every time we asked to come by). After we picked out our puppy, Dexter James Kerstetter, Ryan has show great interest in his development and answered every question and helped get dexter registered for his NA test. He even helped me prepare for the test by meeting me at a training field halfway between our homes. I also used Hoosier Boys for Dexters initial training. I sent him to Ryan for a month and at the end of that month I could not have been happier with how much improvement I could see. 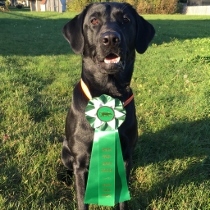 I knew the training would go well because the intelligence of the dogs Hoosier Boys produce is off the charts but I was still amazed with the amount of progress Ryan made with Dexter in that month he was away. I was clear to me he spent a good deal of time working with dexter and it was worth every penny. While dexter was away Ryan would even send me video updates and did a great job keeping me up to speed with the training. The day I was scheduled to pick dexter up Ryan spent over 2 hours going over his training with me, working him in the field and answering questions. I cannot say enough good things about Ryan and Hoosier Boys Kennel. Anyone considering a new pointer puppy or a finished dog should look here! Re: Hoosier Boys Kennel - OUTSTANDING!!! I can second that. Ryan and Ron did all of the bird and gun introductions with my pointing lab pup. I left the training sessions very happy with our progress.